In this episode of Ideate we’ll be exploring the way we book flights, those dehumanizing TSA checkpoints, the contrast of airport lounges, and a love story from Alaska Airlines. What’s lead to the current experience? And what can we learn from our experience to make better experiences tomorrow? Air travel is truly amazing. So why do we hate it so much? What if shopping for health care was as easy as booking a flight? Why aren’t more people using TSA Precheck? What parallels are there between securing an airport and securing a website? What elevates a brand, exclusivity, or inclusivity? How do you get humans to love an airline? You can go to any airline website today and purchase a ticket just like you can buy a MacBook from apple.com. But your seat on your flight is not an object, you are renting one of the hundreds of seats amongst thousands of flights and hundreds of airlines. Renting that seat directly from the airline is a fairly straight-forward problem—when do you want to fly with our airline, do we have a spot for you at that time, here is how much it costs. Add to cart. Pay for seat. Simple. But what about comparing those seats across airlines with their own unique systems? This is exactly what we’ve come to expect thanks to sites like expedia.com, orbitz.com, and priceline.com. Name other industries where this kind of inventory-searching, price-comparing, scheduling system is available on hundreds of different websites. Try to do this for your next haircut, your next dentist appointment, or your next surgery. The medical field is actually pretty similar to the air industry: Pilots = doctors, airlines = health Provider Network, airports = hospitals, flight schedule = medical schedule, etc. But there is no way you’re comparing and booking your hip replacement online from one website. So how is this the norm for air travel, but not healthcare? One of the reasons: healthcare never had travel agents. Travel agents and airlines communicate and collate inventories and requests via Global Distribution Systems (GDS), developed in the early 1970’s. These third-party middlemen take this information, process it, standardize it, and make it accessible to travel agents to do what they do while taking a cut of the ticket price for themselves. Last year the airline industry paid around $7 billion to GDS providers. Many price-comparison websites were built around these same GDS providers, in fact their existence would not have been possible without them. Airlines aren’t huge fans of GDS/price-comparison systems; they would much rather you come directly to them so they don’t have to pay a fee, not to mention prevent any price-forecasting cutting into their profits. Southwest Airlines is one of the very few airlines that has successfully shunned price-comparison websites. They’ve even called on lawyers to keep it that way. Their take is “we’re great. we’re cheap. we’re special” so come to us and you’ll be pleasantly surprised. Airlines no doubt watch their success with jealousy and will continue to incentivize direct booking. GDS and price-comparison websites aren’t going anywhere anytime soon. Mainly because they’re entrenched in the shopping experience that consumers have come to expect. So thank your local travel agent, and wonder what life might be like had there been healthcare agents. What does transportation security really mean? Our Ideate team was interested to know what the most polarizing issues about flying were. When the response came back, not surprisingly, most people’s favorite part of the journey was “getting there faster”, while others appreciated the people watching and views from the plane. But in most cases, the negative was easier to spot. And while we all wish flights were more comfortable, the worst user experience in air travel is probably the dreaded TSA checkpoint. We all want to feel safe. We might even be willing to make certain compromises for that feeling. And if you’re looking for an endorphin release, the TSA’s Instagram account is a good place to start. Bob Burns, a TSA officer at the time, started posting images of objects confiscated at checkpoints to an Instagram account in June 2013. Since then the account has accrued 825k followers, reaching #4 and competing with Beyonce for popularity. According to Bob, the TSA confiscates upwards of 70 firearms a week, many of them loaded. But you’ll also see photos of mummies, swords, and Bob’s favorite, a meat slicer. So the TSA is clearly accomplishing something. A large part of that funding is going to controversial scanning equipment. But as Homeland’s study shows, these scanners are largely ineffective, they lengthen the security process and present serious privacy concerns (The images are NSFW). These privacy concerns, coupled with general disdain for the process has many people excited about TSA Precheck. With an $85 application fee and a thorough background check, TSA Pre allows members to speed through security and not need to remove shoes, laptops, liquids, belts, and jackets in the line. But as Wall Street Journal Columnist Scott McCartney points out, participation has been disappointingly low. So far only 2.77 million people have enrolled which is about the number of passengers that fly in and out of US airports in a single day. (https://www.faa.gov/air_traffic/by_the_numbers/) According to a Bloomberg report published in Time Magazine, “A lower fee and simpler application process would encourage about 7 million more people to enroll in PreCheck.” Part of this can be attributed to many travelers being granted Precheck status for free by TSA’s “behavior detection officers.” It’s just harder to justify a fee for something people are already getting for free. At the core, much of our dissatisfaction with TSA’s process could be attributed to poor communication. This is evidenced by the need for TSA officers to walk up and down the security line yelling instructions at the airport. Shouldn’t this information be communicated before we get to the airport? In a place so concentrated with foreign travelers, can we expect everyone to understand these curt commands yelled out in English? “The info is out there, but people are either not taking the time, or are missing it somehow,” said my TSA friend. “At least half of the people there are not frequent travelers. Never flown before, don’t know what to do. There are so many other things to worry about like their hotel, and their rental car… security is the last thing on their mind.” Clearly, an opportunity exists for someone to bridge the communication gap. At the end of the security line, we find our luggage torn apart in 10 different bins. We have to quickly replace our belts and get our shoes back on so we can rush to our gate on time. In a way, the feeling we’re left with is a metaphor for the information architecture of air travel. All the info you need is somewhere on TSA’s website, but it’s strewn across a host of other information, lost in a sea of anxiety and near-missed deadlines. So, of course, it shouldn’t surprise us that very few people enjoy being in an airport. And the airlines recognized this many years ago. To accommodate their most valued frequent travelers, they sought out secluded recesses in the airport where they could control the environment and make passengers comfortable during layovers. Today airport lounges offer a wide range of amenities. Some offer complimentary food and drink, wifi, places to rest, or even a shower. And as a consequence of the recent de-bundling of airline services, many of these lounges are now available for anyone to purchase access to. So, if you’re a leisure traveler who might not be able to justify a first-class ticket, you might be able to have a first-class experience on the ground for around $35, which is typically what you might be paying for water and those other amenities in the airport anyway. But the success of a service like Loungebuddy hinges on two principles. Tyler says the process needs to be dead simple. “It had to be what I like to call mom approved, meaning that if my mom could use it anyone could use it.” But he also noted that “if a user has to take additional steps that would be considered inconvenient, say download a new app, that could be a barrier to adoption.” So Loungebuddy has made it a priority to integrate with existing services and platforms like Expedia, Tripit, and Amex to be where users already are. They’ve also partnered with premium airlines and rolled out kiosks at check-in desks so users aren’t presented with any additional burdens. During the interview, we noted that good UX is good for business. And though the Alaska team agreed, they needed to clarify their stance. ”￼It’s good for business, and it’s good for people.” They stressed that to them, the user experience is part of a mutual relationship. 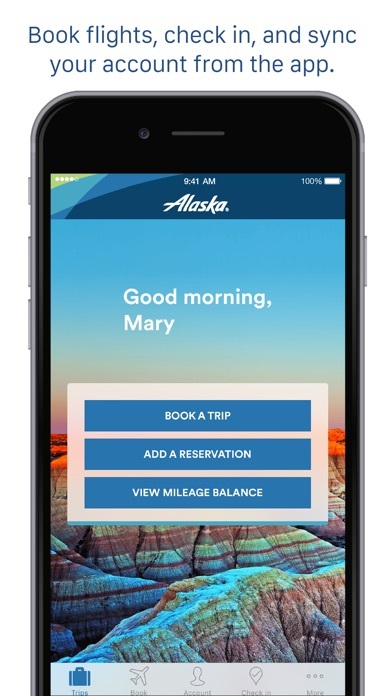 Lanna said, “Alaska’s motto is ‘creating an airline people love’ and love is a very emotional human element.” They pointed out that people don’t typically love an impersonal entity. So to elicit a human emotion, the airline would need to acknowledge the human nature of their guests. You can see bits of that initiative when browsing their Twitter feed. They offered, for example, priority boarding to passengers who wore an ugly sweater on National Ugly Sweater Day. But it also affects the way they approach the design of their app. Lanna says, “from the time that you book a trip to the time you get home there is a long period of time and a lot of steps that you take. Think about when you’re booking a flight. My needs at that time are picking a flight that will get me to a specific destination on time. Fast forward a little bit to the day of travel, and now I am trying to get to my gate. After my flight, I want to see different information. The gate doesn’t matter anymore. So having that variable, dynamic content and to be able to predict and know what people want to have at a certain time is important.” Serving users relevant information based on evolving contexts and priorities is something that all app designers should be concerned with because reducing friction will lead to greater adoption. We need to fight the tendency to view digital experiences as simply a delivery of data. We should consider principles of HUMAN RELATIONSHIPS. We must remember the evolving needs of users. Consider your app as an expression of hospitality. Don’t dump it all in a trough and make guests dig thru it like animals. Try to serve them what they need when they need it. When offering choices be transparent. It can be tempting to make the quick sale by hiding the negative, but the approach is not sustainable. Show your users love, and they’ll love you back.